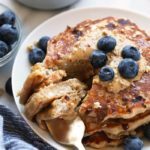 These 3-Ingredient PB2 Pancakes are perfect for a delicious and healthy breakfast. 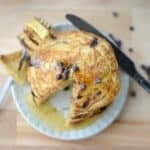 If you are looking for a low carb pancakes recipe that still tastes amazing, this is it! 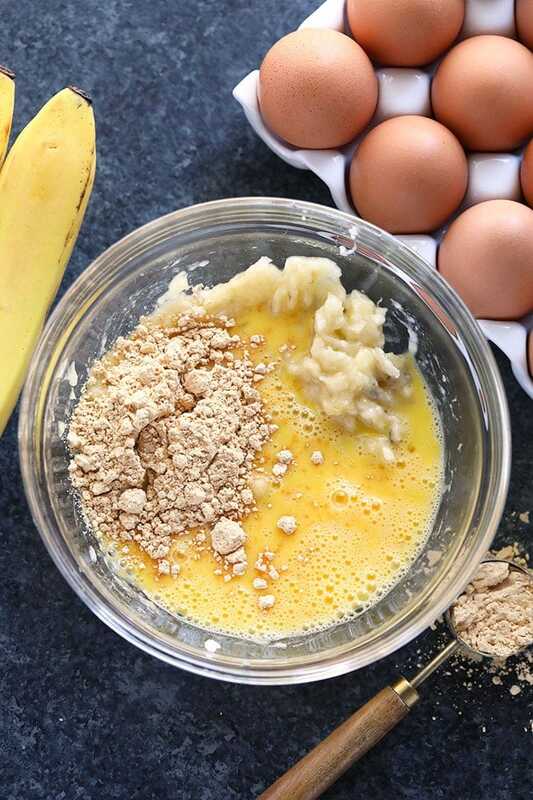 All you need are bananas, peanut flour, and eggs! 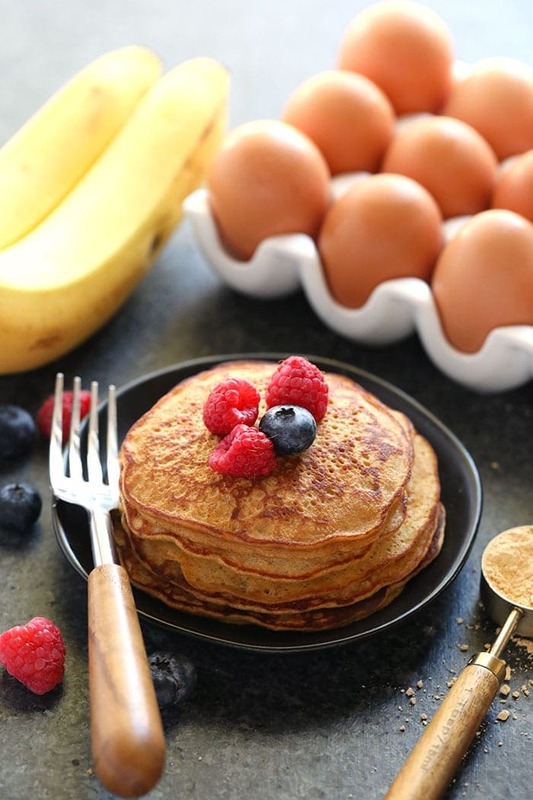 Make a batch of these healthy pancakes this week. So. I have a secret. I didn’t actually use any peanut butter in this recipe. I USED PEANUT FLOUR! 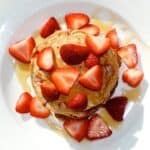 I received a request from an FFF follower that asked us to create more recipes using peanut flour. I used to eat peanut flour all the time, but hadn’t thought about it in forever! 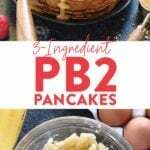 Our cupboards are officially restocked and now we have these tasty 3-Ingredient PB2 Pancakes ready for you to eat. 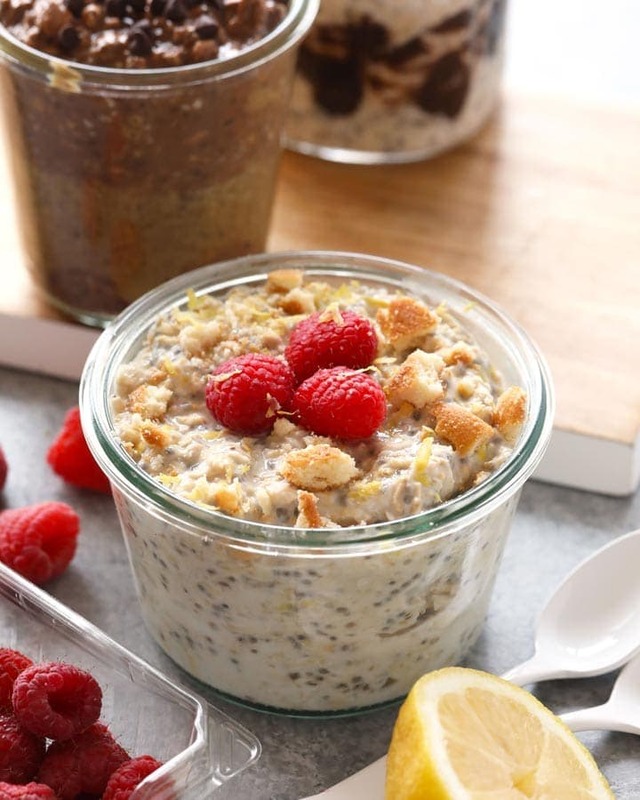 I love peanut flour because it has a ton of protein and that peanut buttery taste you know and love, but is great if you are trying to eat less fat. Peanut flour AKA PB2 is essentially defatted peanut butter meaning that a lot of the fat is sucked out of the peanut butter, leaving a coconut flour-like peanut butter flour! In addition to the peanut flour request, we’ve also received many comments from people asking for a pancake recipe without milk. So, this one is for YOU, my dairy-free homies! And? They taste good. HOLY DAY. With that said, I would like to preface that these pancakes are not your typical super fluffy pancakes, they are a bit thinner and SO DELISH. As you can tell by the title, there are only 3-ingredients involved and we decided not to use baking powder or baking soda to keep this list down to 3. Peanut Flour and PB2 Fun Facts! Like I mentioned above, peanut flour is actually defatted peanut butter. The majority of the fat gets sucked out of peanut flour and leaves a peanut butter flour that tastes just like peanut butter, but has a very different texture (similar to coconut flour). 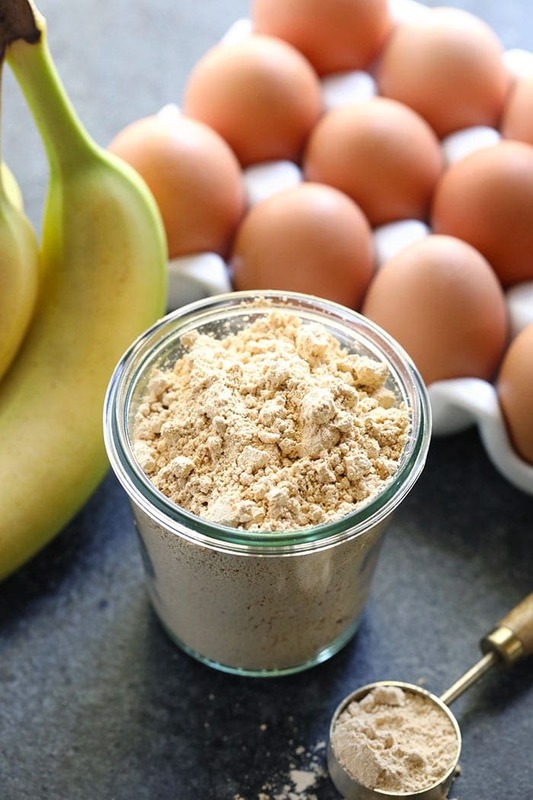 Peanut flour is a great thing to add to baked goods, sauces, and smoothies. Is peanut flour and pb2 the same thing? 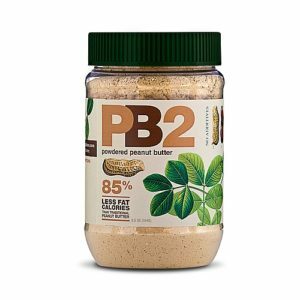 Yes, PB2 is just a brand of peanut flour. Is peanut flour healthier than peanut butter? It’s all relative, people! It all depends on what your health and nutrition goals are. 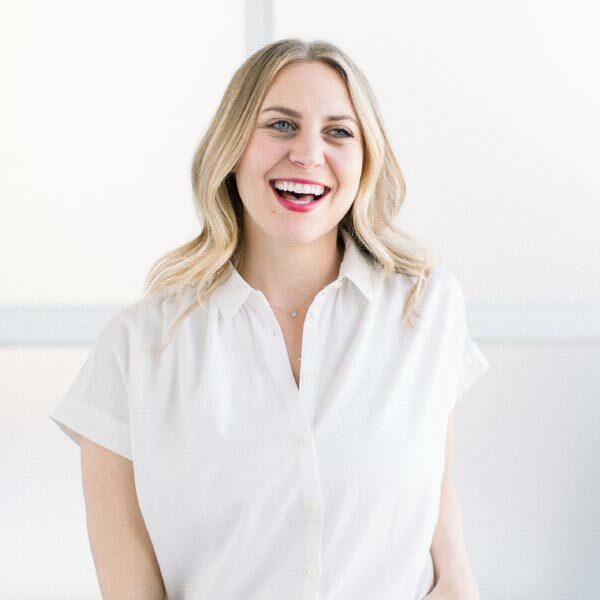 Some people want the healthier fat from all-natural natural peanut butter and some people are looking for the low carb and low-fat option of peanut flour. Please talk to an RD for specific health needs. Check out the nutrition information for peanut flour and peanut butter below. Most peanut flours are gluten-free, however, make sure to check the label if you have a serious gluten allergy. Is peanut flour safe for peanut allergy? NO! If you have a peanut allergy, stay the heck away from peanut flour. We hope you love these pancakes. 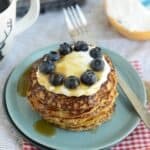 We also have quite a few other pancake recipes on FFF that you can check out. 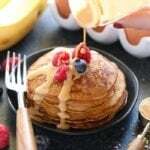 Are you wondering how to make banana pancakes? 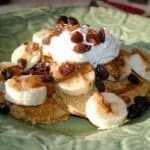 Check out some of our favorite banana pancake recipes below! First, in a medium size bowl, mash your banana until it is smooth (you are more than welcome to do this entire process in a food processor). Add in 2 large eggs and whisk until completely combined. Add peanut flour the bowl and stir until combined and the batter is smooth. Heat a large skillet over low/medium heat and spray with coconut oil cooking spray. 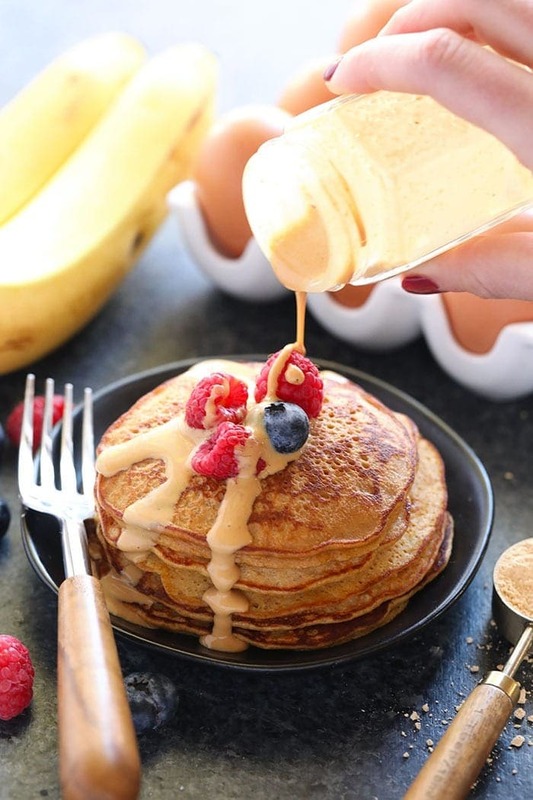 When coconut oil is fragrant, use a 1/4 cup measuring device to scoop the pancake batter into the skillet (the batter should be a little thinner than normal pancake batter). Let cook for about a minute or until the top of the pancake begins to bubble and carefully flip your pancake. Let the second side cook for an additional minute. Remove and place onto a plate. Repeat until batter is gone. To make the peanut flour sauce, place ingredients into a mason jar, cover and shake until combined. Pour over your pancakes and enjoy! Nutrition does not include peanut flour sauce.